Louis of France (1 November 1661 – 14 April 1711) was the eldest son and heir of Louis XIV, King of France, and his spouse, Maria Theresa of Spain. As the heir apparent to the French throne, he was styled Dauphin. He became known as Le Grand Dauphin after the birth of his own son, Le Petit Dauphin. As he died before his father, he never became king. His grandson became Louis XV of France. 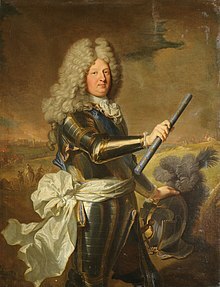 Louis was born on 1 November 1661 at the Château de Fontainebleau, the eldest son of the young French King, Louis XIV of France, and his Spanish wife, Maria Theresa of Spain. As a Fils de France ("Son of France") he was entitled to the style of Royal Highness. He was baptised on 24 March 1662 at the chapel of the Château de Saint-Germain-en-Laye and given his father's name of Louis. At the ceremony, the Cardinal de Vendôme and the Princess of Conti acted as proxies for the godparents, Pope Clement IX and Queen Henrietta Maria of England. The latter was Louis's great-aunt. It was for this occasion that Jean-Baptiste Lully composed the motet Plaude Laetare Gallia. Louis XIV secretly nursed the same suspicious jealousy of the Grand Dauphin that Louis XIII had once shown to himself. No prince could have been less deserving of such feelings. Monseigneur, as the heir to the throne was now known, had inherited his mother's docility and low intelligence. All his life he remained petrified with admiration of his formidable father and stood in fear of him even while lavish proofs of 'affection' were showered upon him. The best way for Monseigneur to do someone an injury was to commend him to the royal favour. He knew it, and did not conceal it from his rare petitioners. Louis XIV saw to it that his son's upbringing was quite the opposite of his own. Instead of a devoted mother and an affectionate and likeable tutor, the Dauphin had the repellent and misanthropic Duc de Montausier, who ruthlessly applied the same methods that had so disturbed Louis XIII. They annihilated his grandson. [...]Bossuet overwhelmed his backward pupil with such splendid lessons that the Dauphin developed a lasting horror of books, learning and history. By the age of eighteen, Monseigneur had assimilated almost none of the knowledge amassed to so little purpose, and the apathy of his mind was second only to that of his senses. It was said that when Louis was an adult, he could pass a whole day simply tapping his cane against his foot in an armchair. Nonetheless, his generosity, affability, and liberality gave him great popularity in Paris and with the French people in general. Louis was one of six legitimate children of his parents. The others all died in early childhood; the second longest-lived, Marie Thérèse of France, died at the age of five when Louis was 11. Alive especially to political considerations, the King considered various European royal daughters as possible wives for his heir, such as Anna Maria Luisa de' Medici, Louis' own cousin Marie Louise d'Orléans, daughter of Philippe, Duke of Orléans, and Princess Henrietta of England. According to various reports, Marie Louise and Louis were in love, having grown up with each other. However, Louis XIV decided to use Marie Louise to forge a link with Spain and forced her to marry the invalid Charles II of Spain, the Dauphin's own half-uncle. Louis was engaged to his second cousin, Maria Anna Victoria of Bavaria, when he was seven. She was a year older than Louis and, upon arriving at the French court, was described as being very unattractive. Nonetheless, she was a very cultured princess, and made initially a good impression upon her arrival as she was able to speak French fluently. They were married by proxy in Munich on 28 January 1680; the couple met for the first time on 7 March 1680 in Châlons-sur-Marne. Although he was permitted at first to attend and later to participate in the Conseil d'en haut, Louis did not play an important part in French politics. Nonetheless, as the heir to the throne, he was constantly surrounded by cabals battling for future prominence. Apart from the minor political role he played during his father's reign, Louis engaged in more leisurely pursuits and was esteemed for his magnificent collection of art at Versailles and Meudon. Louis XIV purchased Meudon for him from the widow of Louvois. The Dauphin employed Jules Hardouin Mansart and the office of the Bâtiments du Roi, but most particularly his long-term "house designer" Jean Bérain, head of the Menus Plaisirs, to provide new decors. He lived quietly at Meudon for the remainder of his life surrounded by his two half-sisters Marie Anne de Bourbon and the Princess of Condé, both of whom he loved dearly. These three made up the main part of the Cabal de Meudon which opposed the Dauphin's son Louis and his Savoyard wife, the Duchess of Burgundy. Louis is said to have hunted wolves to extinction in the Île-de-France. In sending you to command my army, I am giving you an opportunity to make known your merit; go and show it to all Europe, so that when I come to die it will not be noticed that the King is dead. I shall not compliment you on the taking of Philippsburg; you had a good army, bombs, cannons and Vauban. I shall not compliment you because you are brave. That virtue is hereditary. But I rejoice with you that you have been liberal, generous, humane, and have recognised the services of those who did well. Louis' capture of Philippsburg prevented the large gathering Imperial army from crossing the Rhine and invading Alsace. Louis's position in the Conseil d'en haut gave him an opportunity to have his voice heard in the years and crises leading up to the War of the Spanish Succession. From his mother, Louis had rights and claims to the Spanish throne. His uncle Charles II of Spain had produced no descendants and, as he lay dying, had no heir to whom he could pass the throne. The choice of a successor was essentially split between the French and Austrian claimants. In order to improve the chances of a Bourbon succession, Louis gave up his (and his eldest son's) rights in favour of his second son, Philip, Duke of Anjou (later Philip V of Spain), who, as second son, was not expected to succeed to the French throne, thus keeping France and Spain separate. Moreover, in the discussions in the Conseil d'en haut regarding the French response to Charles II's last will and testament, which did indeed leave all Spanish possessions to Anjou, Louis persuasively argued for acceptance. He opposed those who advocated a rejection of the will and the adherence to the Partition Treaty signed with William III of England, even though that Treaty had awarded Naples, Sicily and Tuscany to him. Louis died of smallpox on 11 April 1711, at the age of 49, predeceasing his father. The Delphin Classics was a large edition of the Latin classics, edited in the 1670s for Louis (Delphin is the adjective derived from dauphin) Thirty-eight scholars contributed to the series, which was edited by Pierre Huet, with assistance from several co-editors including Jacques-Bénigne Bossuet and Anne Dacier. Louis married Duchess Maria Anna of Bavaria on 7 March 1680. She was known in France as Dauphine Marie Anne Victoire. Although the marriage was not a close one, the couple had three sons. The Dauphine died in 1690 and in 1695 Louis secretly married his lover Marie Émilie de Joly de Choin. His new wife did not acquire the status of Dauphine of France, and the marriage remained without surviving issue. Pregnant at the time of her marriage, Mlle de Choin gave birth to a son, who was secretly sent to the countryside; the child died aged two, in 1697, without having been publicly named. Thus, through Burgundy and Anjou, Louis ensured the continuation of the senior Bourbon line on the throne of France and the establishment of the Spanish Bourbon dynasty respectively. Charlotte de Fleury (6 February 1697 – 1750) – wife of Gérard Michel de La Jonchère. Louise Émilie de Vautedard (1694–1719) – wife of Nicolas Mesnager. Legend has it that a prophecy told at his birth said that Louis would be "son of a king, father of a king, but never a king". This was thought to be fulfilled as he was the son of Louis XIV of France and father of Philip V of Spain, but did not himself become king. Louis's paternal grandparents were Louis XIII of France and Anne of Austria; he was descended, on his mother's side, from Philip IV of Spain and Élisabeth of France. Louis XIII and Élisabeth de Bourbon were siblings (the children of Henry IV of France and Marie de' Medici), as were Anne of Austria and Philip IV, who were the children of Philip III of Spain and Margaret of Austria. That means that he had only four great grandparents instead of the usual eight, and that his parents had the same coefficient of coancestry (1/8) as if they were half-siblings. Patrilineal descent is the principle behind membership in royal houses, as it can be traced back through the generations – which means that if Prince Louis were to choose an historically accurate house name it would be Robertian, as all his male-line ancestors have been of that house. Wikimedia Commons has media related to Louis, Grand Dauphin. ^ Achaintre, Nicolas Louis, Histoire généalogique et chronologique de la maison royale de Bourbon, Vol. 2, (Publisher Mansut Fils, 4 Rue de l'École de Médecine, Paris, 1825), 479. ^ a b c d e f g h i j Anselm de Guibours (1726). Histoire généalogique et chronologique de la maison royale de France [Genealogical and chronological history of the royal house of France] (in French). 1 (3rd ed.). Paris: La compagnie des libraires. ^ a b Chisholm, Hugh, ed. (1911). "Philip III., king of Spain" . Encyclopædia Britannica. 21 (11th ed.). Cambridge University Press.